These deck design ideas are here to inspire you and get you ready for your own home renovations! 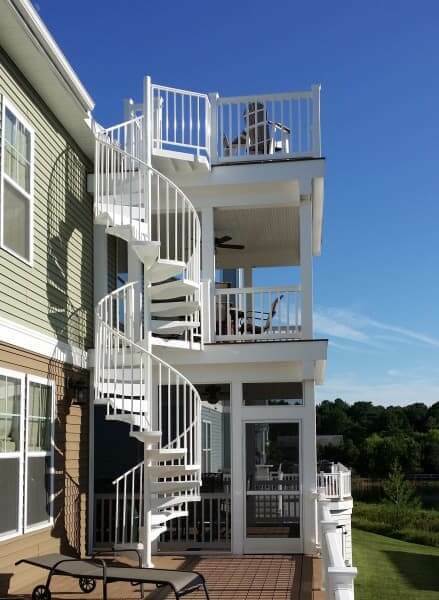 This first deck design idea features a spiral stair that connects several decks. Multi level deck designs are great for homes that are looking to make the most of their outdoor space without building out. Each level of the deck gains a level of protection from the elements, allowing the homeowner to enjoy their decks during any season. This particular stair is an aluminum powder coated spiral stair. The naturally rust prohibitive spiral stair is finished with a powder coating process that gives the stair a maintenance free barrier. The homeowner chose to add matching deck railing and diamond plate treads for added safety in all weather conditions. By keeping the width of the stair small, they were able to make the most of all three levels to their deck. This deck has a classic design that utilizes modern elements to create a unique deck for this home. Instead of using lumber, which will become damaged and decay over time, the builder used a natural color composite. Unlike lumber, composite is maintenance free and does not need to be sealed to ensure your deck’s longevity. The deck has as darker color composite around the perimeter to create a finished look. The cable railing gives a modern touch to the otherwise classic deck design. The deck is split into two areas by the pagoda on the far side. That sections off the outdoor dining area, while there is a small casual seating area with an umbrella. The canopy can be closed off in case of bad weather. The casual chairs are wicker with outdoor fabric and the dining table and chairs are slate and metal frames for durability in the outdoors. This is a classic second floor deck design that has endless possibilities. You can change out the furniture for a completely new look and purpose for your deck. 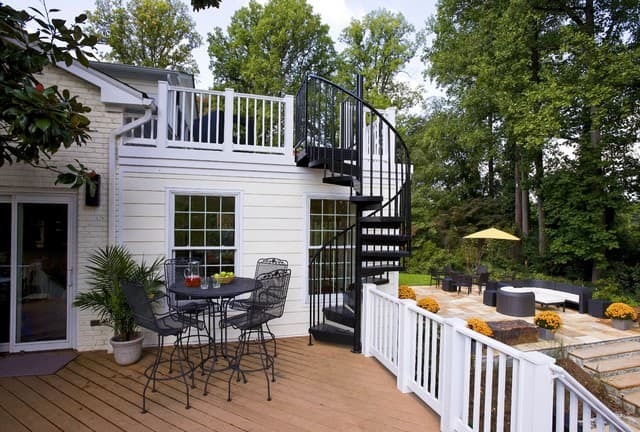 See new ways to add to the value of your deck with the simple installation of a spiral staircase. Request a consultation or contact us directly at 1-800-368-8280. This rustic deck design is the perfect addition to a Traditional style home. 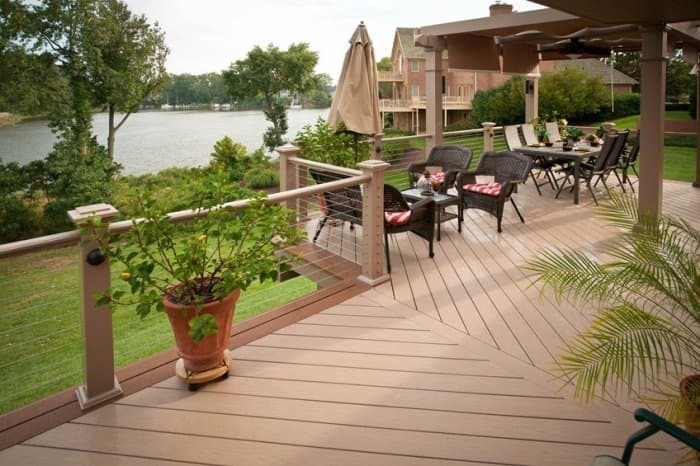 The all wood deck matches the colors of the home, with warm wood and muted cedar green. 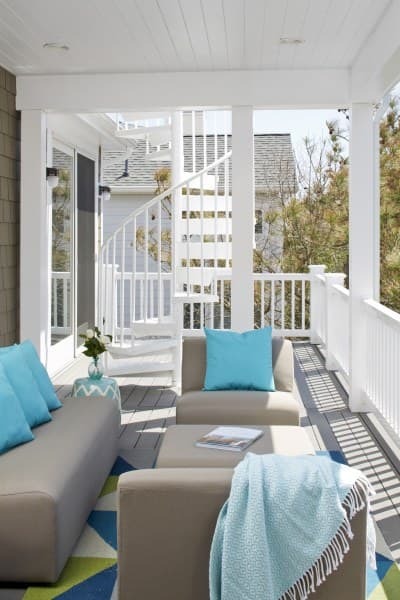 This creates a seamless transition from home to deck, which is something many homeowners look for. You want your deck to be an extension of the warmth of your home. This deck gets the best of both worlds by adding skylights to the ceiling of their covered deck. They have protection from the rain, but the skylights allow for plenty of sun to pass through. The installed lights also create an outdoor living room for the homeowners and their guests to enjoy in nicer weather months. 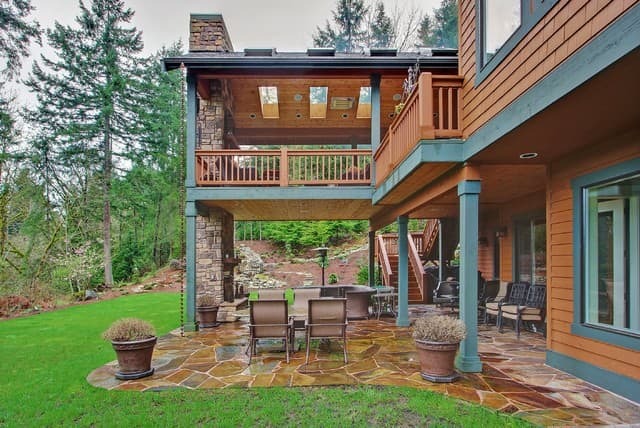 This deck features a two level stone fireplace, furthering the indoor outdoor motif. This deck design combines a rooftop deck and patio to create a dynamic outdoor entertaining space. This homeowner decided to utilize previously unused space by converting the roof of their home into a small deck. They decided to put the grill on the rooftop deck , creating zones for more successful outdoor entertaining. This keeps the host or hostess involved in the outdoor party, but the smoke away from guests’ conversations. This is the perfect application for a spiral stair. The homeowner didn’t want to take up a lot of room, as space was limited. This aluminum powder coated spiral stair takes up a small circle of the deck. By bumping out the spiral past the railing, they were able to save even more space. 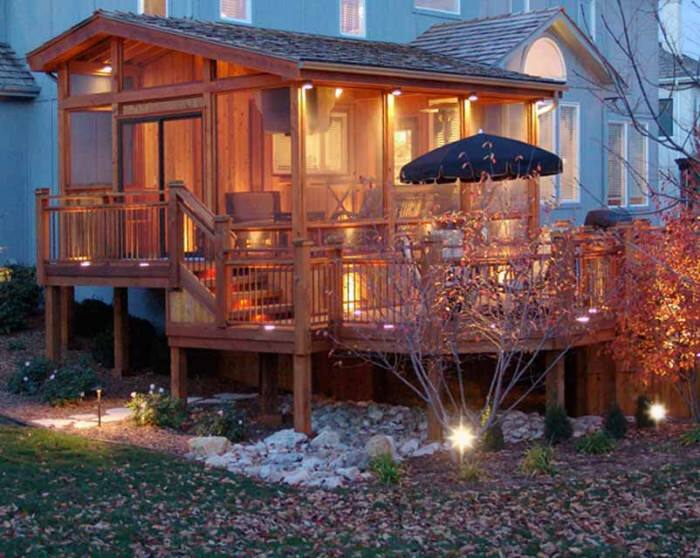 This covered porch gives the homeowners a rustic cabin getaway right in their backyard! An all wood design adds warmth to the otherwise all stucco house. This deck features indoor and outdoor sections that give the homeowners options to enjoy their backyard. A screened in covered porch gives them a three season room for rainy days and a place to relax away from the bugs. The lighting ties together the space by adding an extra layer of design and warmth to the already unique deck. This is another residential rooftop deck connected to another common level deck. This house features a very modern deck. The house itself is clearly simplistic in style and design with sleek lines and geometric shapes. The combination of metal and wood add an industrial flair to the outdoor space. The use of cable railing adds a minimalist design element. Once again, this is a great use of a spiral stair. 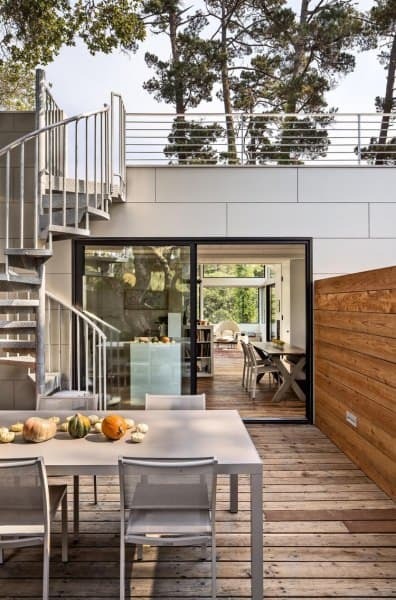 The homeowner chose a Galvanized Exterior spiral stair to match the industrial design of the deck. Not only does it have a metallic silver finish, but it’s also maintenance free. The galvanizing process weather proofs the stair making is a great option for outdoor applications. The diamond plate treads add an element of safety with a non-skid surface. This deck is more of an outdoor living room, complete with couches, arm chairs, and a coffee table. The homeowner decided to take advantage of their home’s amazing views and create a place to enjoy their surroundings, either alone or with guests. The deck combines minimalist and utilitarian design styles. The deck itself was constructed with composite decking materials, meaning it is maintenance free. 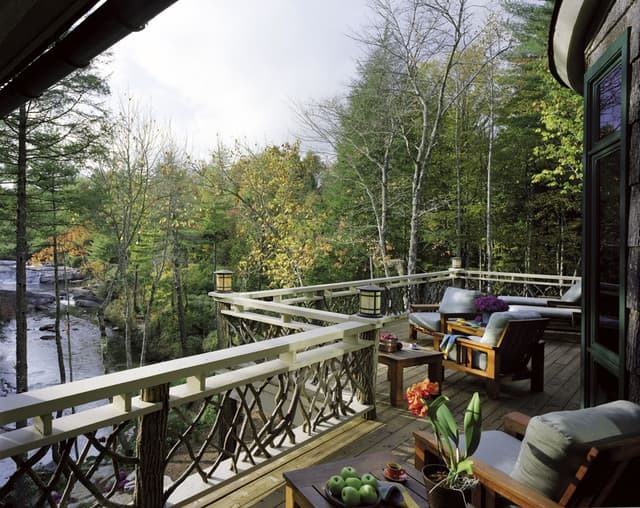 The cable railings leave the views uninterrupted no matter what angle you’re sitting at on the deck. The colors are kept relatively simple, with muted greys and blacks. The chairs and couches are simple designs with basic metal frames. Pops of color are pulled in with oversized floor cushions. Overall, this deck is a trendy spot to enjoy the beautiful surroundings. This deck is one part of a multi level deck design. Because it’s the lower part, this deck has a bead board ceiling which gives the entire deck a traditional feel. The homeowner keeps as much open space as possible by using a spiral stair. Not only does the Aluminum Powder Coated spiral stair have a small footprint, but the white color ties the stair into the rest of the deck design. The stair matches the deck railing, making it one cohesive design. The furnishing on the deck have been kept relatively simple with basic seating designs. The design features classic colors of greys with beige undertones and whites that are accented with teals and greens. This outdoor living room is tied together by a rug at the center of the space. 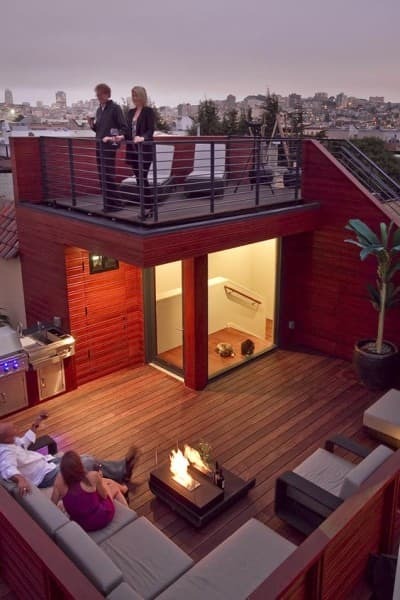 This rooftop deck went one step further by adding a second level above the rooftop! 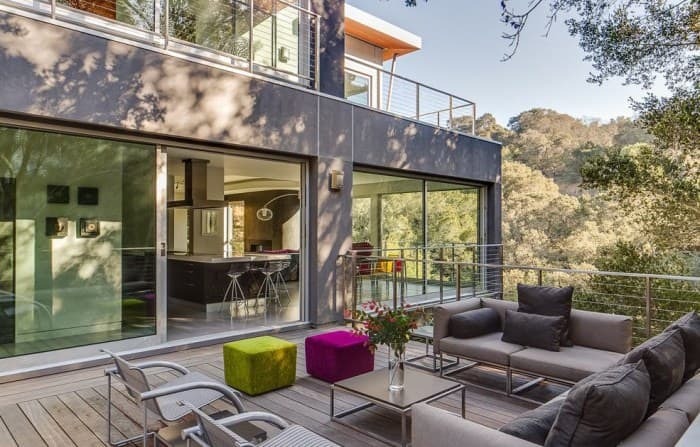 This modern deck takes advantage of the urban views by utilizing cable railings. Not only are red walls are a trendy and bold design choice, they pull out the warm tones of the wood decking. The lower level has a cozy seating area. The built in bench wraps around the table top fire pit. To the left of the seating area is an outdoor kitchen complete with a grill, small refrigerator, and a sink. This keeps the full party outdoors and the host or hostess involved! The door way is all glass adding another modern touch to the rooftop deck. This deck is truly a breathtaking addition to any home. The homeowners designed a deck that fit perfectly into the surroundings. The color choices allow the deck to blend seamlessly into the surrounding nature. The railing is made from thick branches that are crossed to create a lattice pattern. This adds safety and ties the trees into the deck itself. The lanterns on the corners are subtle and perfect for the rustic décor that the rest of the deck features. The stained lumber used for the chairs and tables are accented by natural decorations, such as flowers and apples. This deck is the perfect place to sit back and take in the amazing views. This is another beach house that wanted to take advantage of all of their possible outdoor space. The top floor is a small balcony that leads down to a wraparound deck at the middle of the house. The bottom floor is the standard porch that is also a part of the dock. Because beach houses are often built very close to one another, building up is the best way to create new space. This multi level deck design is tied together by a Galvanized Exterior spiral stair. 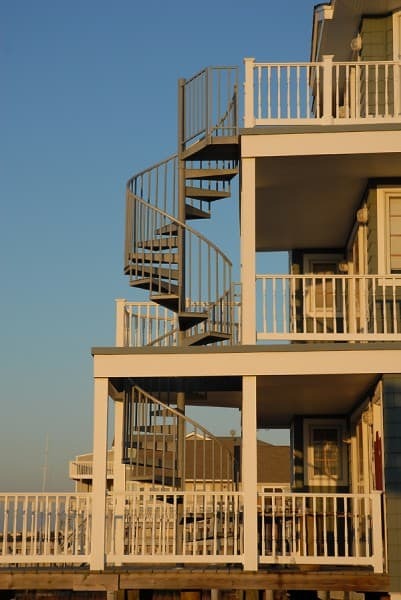 Not only does the spiral stair save space, but galvanized steel is perfect for coastal areas. The carbon steel frame is hot dipped to create a maintenance free and weather proof finish on the stair. This keeps the first cost your only cost. 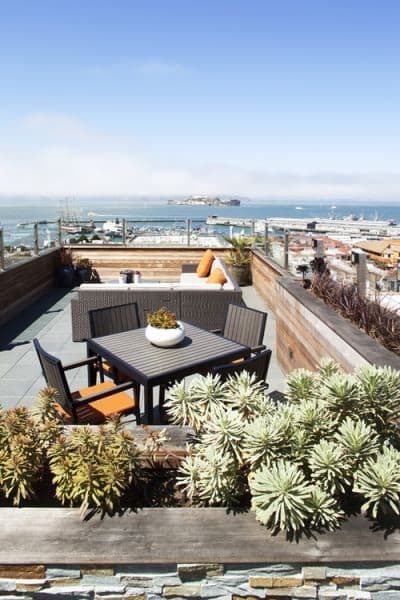 This coastal rooftop deck is the ideal spot to relax and take in a summer breeze and watch the boats come in. This deck uses plants as dividers keeping the space from feeling too urban and industrial. The cement floors are paired with wood paneling on the walls to keep the space simple. The deck zones itself with a dining area and a seating area with a coffee table. All of the furniture is low maintenance outdoor furniture with weaving and wood. The couch has cushions and pillows that are made from outdoor fabric. These deck designs show a wide range of styles and materials used to create the ideal outdoor spaces. No matter where you plan to build your deck or what climate it's in, you can have a beautiful space. Use this list as inspiration to create a unique deck in your backyard!